Can't find a participating theater within 30 miles? No problem. Just go to the theater closest to you, pay, and send us your receipt and certificate. Did a participating theater mistakenly turn you away? No problem. Just send us your receipt and certificate. For full acceptance guarantee and reimbursement instructions click here. There are no theaters close to me: What do I do? Don't have a locator code? Where Do I Find My Locator Code? 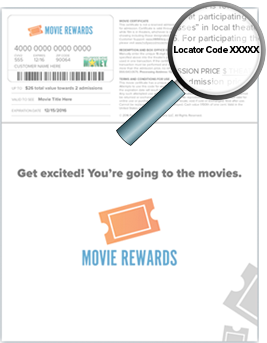 The locator code can be found on your Hollywood Movie Money Certificate and helps to identify which theaters will accept your certificate.